The Laser Weapon System (LaWS) consists of a 30-kilowatt solid-state infrared laser, a Phalanx CIWS (close-in weapon system) radar detection and tracking system, and a special computer terminal that controls the LaWS. Somewhat amusingly, the main interface with LaWS is a controller that looks a lot like an Xbox controller but more rugged and military-looking. In the video, the LaWS disables a small Scan Eagle-class UAV, detonates a rocket-propelled grenade (RPG), and burns out the engine of a small inflatable boat (RHIB). 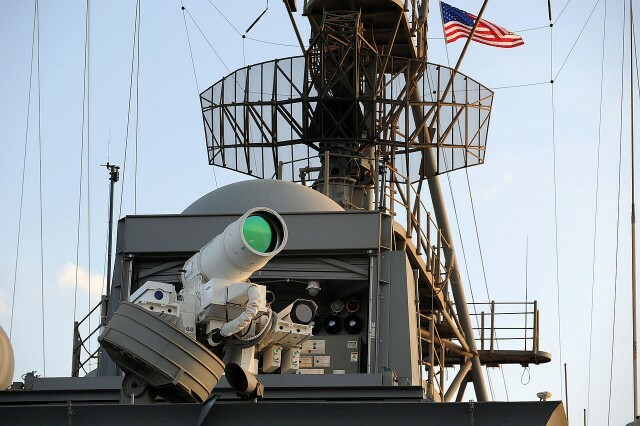 Following these successful tests, the US Navy has given the commander of USS Ponce, with which the weapom system was deployed with back in April permission to use the laser weapon in combat.